MK Dons’ top scorer Nicky Maynard has left the club after turning down a contract to stay at stadium:mk. The 29-year-old scored eight times for Karl Robinson’s side after signing on a free transfer in September, but despite being offered a deal to stay, has decided his future lies elsewhere. 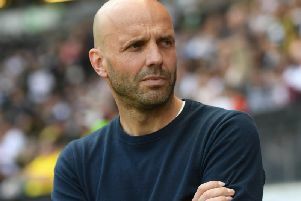 Maynard will be joined by Antony Kay, Jordan Spence and Matt Upson in heading for the exit as Dons revealed they wouldn’t be offering the trio contract extensions following their relegation from the Championship. The manager will meet with Carl Baker, Cody Cropper, Charlie Burns and Alex Revell - all of whom are out of contract - to discuss their futures. Ben Tilney and Giorgio Rasulo have had their one-year extensions exercised. Losing his top scorer was a real blow for Robinson though. “I was so desperate for Nicky to stay,” said Robinson. “I think his ratio is one in three starts at Championship level - that’s the quality he possesses. “He’s only been at League 1 level once, and I think he got 20 goals for Crewe. He’d have been the best striker in League 1. His ball retention is excellent, his movement is excellent, and his goal are a lot like Will Grigg’s: right place, right time. That was a big disappointment for me. “It was a difficult year for Matt Upson and it didn’t turn out how he wanted it to. “Jordan Spence had two spells here, but if he can find the consistency in his game, he’ll be a top player. But we’ve got George Baldock, who is the future of the football club. “(Antony Kay) has been in for some unfair criticism of late. I get the reasons, but he gave his heart and soul to this club. “He’s as honest as the day is long. He’s a great person. I want to thank him above everybody because he’s someone I’ve got so much respect for. “We lost Shaun Williams, and we didn’t really know which way to turn. Kay stepped in and I wish him all the best.